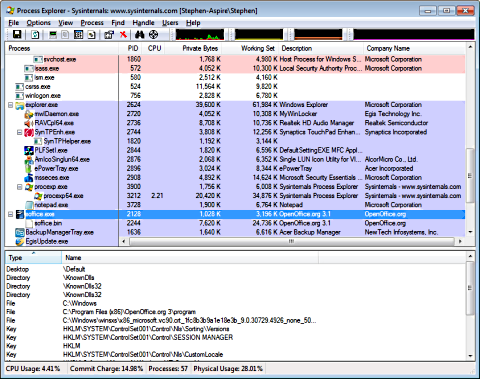 Process Explorer is a more sophisticated version of Windows built-in Task Manager with a rich set of features for collecting information about processes running on your PC. It can be used as a troubleshooting tool to examine processes to see which are utilizing excessive CPU time, or which resources that are held by which process. Process Explorer is a free utility that can be downloaded from Microsoft. Extract the downloaded file ProcessExplorer.zip, then double click on procexp.exe If a warning message box appears, click on the [Run] button. When the License Agreement message box appears, click on the [Agree] button to run Process Explorer. Process Explorer displays a list of currently running processes, their names, their dependencies, PID (Process ID), CPU utilization, memory usage, description, and company name. In Process Explorer's View menu, set a checkmark next to Show Lower pane. If you click on a process in the top pane, you'll see more information about that process in the bottom pane. The information displayed in the bottom pane depends on the mode that Process Explorer is in: if in handle mode it will display the handles that the process selected in the top window has opened; if in DLL mode it will display the DLLs and memory-mapped files that the process has loaded. If you double-click on a process in the top pane, that processes Properties dialog box will appear. 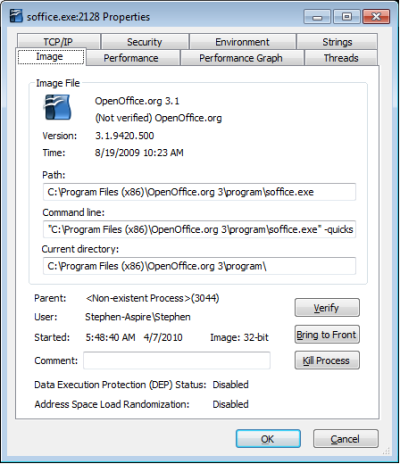 The processes Properties dialog box, Image tab will tell you the location of processes file and the command line used to start the process. This is important information if you want to remove the program from your computer.